This article originally ran in PC Gamer issue 329 early last month. Subscribe here to have our monthly magazine sent to your door or digital device. I spoke to some of the lead developers of the Battlefield V campaign about the process of its creation, their goals with various sections of the anthology, their thoughts on audience reactions, and the potential future of singleplayer campaigns in the Battlefield series. Coming away from the well-received vignette structure of Battlefield 1, what storytelling traits did you want to carry forward into Battlefield 5? Eric Holmes, design director, Battlefield 5: I think what we found was a way to weave a story and gameplay in a way to emotionally reach the player. It might sound obvious, but that was our biggest takeaway. Battlefield has always had spectacular, high-agency experiences. But the ‘feels’ were new to the series. That was what we wanted to build on most. Battlefield 5 often uses mechanical progression and spatial design to directly strengthen the narrative of a given campaign. What did the partnership between narrative and gameplay teams look like behind the scenes? How much did this workflow allow for iteration? Eric: We break each story into roughly 15-minute sections, with a story map guiding us to what each is about, both for narrative and gameplay. When it was best, we were collaborating on experiences to blend gameplay and narrative together. Usually, there were great ideas that would appear during development of those pieces—for example, the ad-hoc off-key song with Bridger and Mason toward the end of Under No Flag. You have to be playing the game to come up with ideas as to what would make it sing. Another example would be the DICE animation team having us chase the document satchel in the storm in Nordlys. I can’t even tell you whose idea that was, but it was a great moment. How much do multiplayer considerations (including environment reuse, weapon balancing, etc) affect the singleplayer design of a Battlefield campaign? As the game’s multiplayer portion updates over time, are there dependent factors in the singleplayer portion that require adjustment as well? Eric: Oh, so very much. You’ll notice the health system is different to multiplayer. In MP this relies on health packs from allies. But in the War Stories there aren’t always friends nearby. The philosophy behind this is key—multiplayer is about fairness and balance. But singleplayer is usually about a dominant player, since a K:D of 1:1 vs AI just isn’t very fun. Thankfully the weapon feel in BF5 is a real strength. Those are pretty much 1:1, although the damage vs AI makes them more deadly than in MP. Replayability is embedded into the campaign of Battlefield 5, from standard collectible items to bespoke challenges that require players to approach the same level in different ways to unlock unique rewards. What wider design goals does this serve? Eric: There are many types of players out there. Some don’t give two hoots about collectibles. But there are explorers and completionists who must go everywhere and get everything. The collectibles are principally for them. The payoff is somewhat simple—our letters—but we hoped they would give a little more life and depth to our world. Nothing revolutionary there. To also occasionally pair up the collectible with a uniquely placed tool allows players of all types to find new ways of approaching the encounter at hand, thus broadening the attraction to go looking for these collectibles. The challenges are about more than just replay value. They build player familiarity with the weapons and vehicles of the core game. Our hope was players who engage with them find themselves building skill for that inevitable confrontation in multiplayer. The writing in the campaigns, from the Guy Ritchie-esque comedy in Under No Flag to Tirailleur’s retrospective structure, seems particularly sharp this time around. How did your teams approach the writing for Battlefield 5? Did you make any major changes compared to Battlefield 1? I imagine capturing concepts traditionally associated with World War II, like heroism or brotherhood, is difficult without straying into what have become cliches. Eric: Thanks for the kind words! I will pass them on to Steven Hall, our lead writer on both this game and Battlefield 1. Steven is the real hero here—he was the guide through the emotional journey and often dangerous ground. One guideline we started in BF1 was to “let the era speak”. I think that led to a lot of interesting choices as to what and how to depict certain things. For example, I think we at DICE are all very proud of what the prologue invoked. The Second World War is a different beast from the first. Faster. Broader. Bigger. More dynamic. That informed our prologue for Battlefield 2, for example. But the Second World War also has a special type of darkness that is unique to that setting. And we knew we had to confront and acknowledge that somehow. Another differentiator was new additions to the cinematic team, for example, our director Pelle Hallert. Our cinematic directors on BF1 were Markus Kryler and Fredrik Akerstrom—a phenomenal double-team. But for this title, they were already booked on another project. So we looked far and wide to find someone who could match them, but not imitate them. After an exhaustive search, we found we had the chance to work with Pelle. His style is his own, and I think that helped to differentiate the two just by his eye and hand being his own. He has an extensive history in TV—check out Jordskott—for which I believe he was the director of photography. Meanwhile, in gameplay, we have Justin Langley working across each story providing a barrage of VO for countless events to bring our story into gameplay. Justin is a pro that knows game VO like nobody else—check out his game credits on Mobygames. He and his team pore over the game to squeeze in story anywhere they can. There are so many contributors to the final result that I wish I could name them all. Collaborating from the structure, writing for gameplay and scenes and placing each event is a real team effort driven by a group of passionate, talented professionals. Steven Hall, lead writer, Battlefield 5: WWII is a very familiar war, compared to WWI, so we were very aware from day one that whatever we did needed to work a little harder to find an identity of its own. From a writing perspective, I tried to vary the tone and narrative structure of these War Stories more than those in BF1, to give each one a distinct voice and identity. And much like he did in BF1, Eric brought a whole armful of WWII conflicts, battles, and events to the table that I hadn’t even been aware of. So between us, we started to find some interesting things. It’s a team effort as always, so many people brought interesting ideas and scenarios and suggestions. Sitting down as a team, it took us quite a while to settle on a final four! The subject matter tackled by the Battlefield 5 campaigns tends to be nuanced, heavy material. Tirailleur discusses the erasure of people of colour, Nordlys showcases a struggle between duty and love in a maternal relationship, The Last Tiger stars a crew of Nazis, and so on. However, the length of this mode is shorter than ever—even considering the length of individual campaigns in Battlefield 1. How did your team approach fitting this complex material into an extremely tight timeframe, and in your opinion, did you succeed? Eric: It’s not really for me to say if we succeeded—that’s up to each player of the game. I certainly hope they enjoy each of them. But like BF1 I suspect everyone will have a favourite that speaks to them the most. Battlefield 5 brings the series back to World War II, but particularly in its singleplayer portion, is set in areas of the conflict that aren’t typically shown in popular media. Was this a calculated risk? What did the team gain (and lose) by not being able to return to old standbys like the Normandy landing? Eric: We decided from the outset that to go to WWII we had to bring something new to the mix. I believe that was part of the reason Battlefield 1 drew players in. But there is an enormous amount of media about WWII, so our challenge was to move beyond what you have already seen and make it fresh again. Hopefully, we have surprised players with our choices. What criticisms of the singleplayer campaign of Battlefield 5 have your team taken onboard as useful feedback going forward? Will we see more significant additions to the singleplayer portion in the future, like the ultimate release of The Last Tiger with the Overture update? Eric: We absolutely listen to players about what they enjoy most or what they struggle with. From YouTube playthroughs, through Twitter threads to in-depth forum essays. DICE listens and engages. It’s always great that people say they want more. That’s better than people saying they’ve had enough. As for future plans, I can’t announce anything here. But I am glad to hear you’re interested. Considering public reactions to the campaign of Battlefield 5, do you believe that a dedicated singleplayer mode of this scale is still a key portion of a Battlefield product? 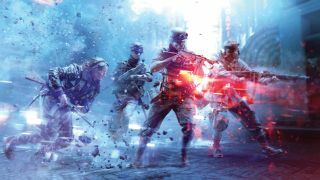 Lars Gustavsson, creative director, Battlefield 5: It’s too early to talk about the future here but the positive reactions we have gotten for our War Stories, and the way they help us frame the historical era at hand, they are certainly a strong part of the full Battlefield 5 offering. We have a diverse audience of different player types and this is where the narrative experiences can shine through and fulfill the needs of all those who want additional dimensions to the world that they experience, be it in singleplayer or modes with more players.